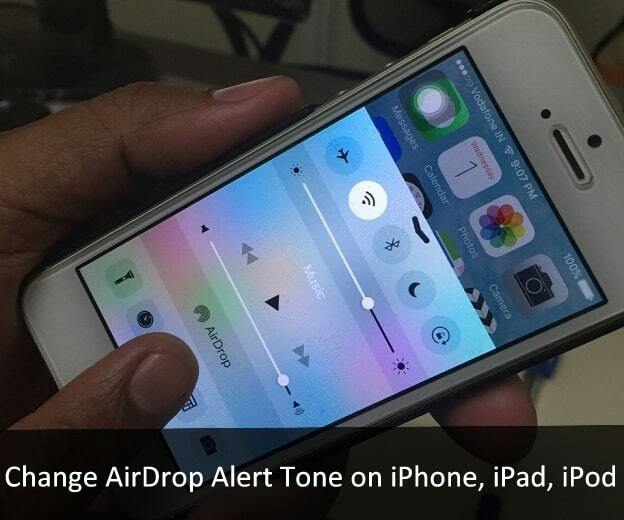 Here’s guide to mute or Change AirDrop Sound effect on iPhone, iPad and running All iOS devices. The AirDrop is a local peer to peer file sharing feature in Apple iOS 11 and earlier iOS devices. Airdrop does work to transfer files between iOS to iOS as well as iOS to Mac OS and vice versa. While on other Smartphone operating system users are uses Bluetooth to share Photos, Videos, locations, and more between devices. Even though, Airdrop is much faster tool compared to Bluetooth cause AirDrop runs with Wi-Fi and Bluetooth. On the Control Center located AirDrop is a customized feature, so you can make yourself discoverable and coverable nearby Apple devices like MacBook Pro, MacBook Air, iPhone, iPad, iPod. AirDrop for Everyone, Contacts Only. Whenever you receive a file via AriDrop at that moment you hearing a default sound alert to accept or decline senders file, media or other items. 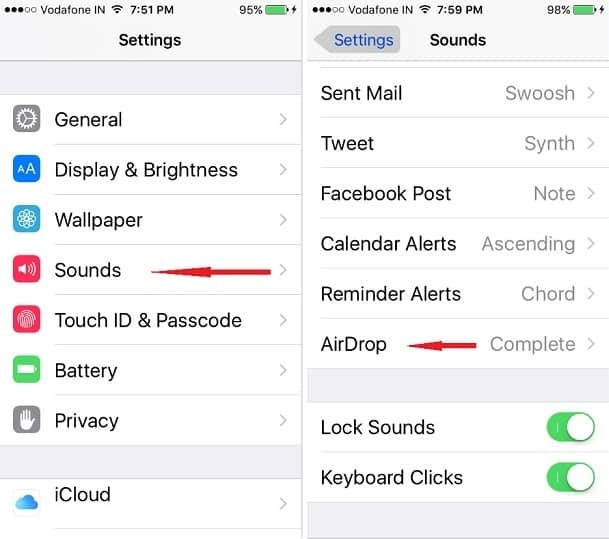 If you don’t like default alert tone of AirDrop, then read below guide to change it. Try these iPhone Specker docks to boost sound in your home. Step 1. Go to Settings app from your iPhone Screen. Step 2. Tap on Sounds appears between Wallpaper & Touch ID & Passcode. On iPhone 7/ iPhone 7 plus tap on Sound & Haptics. Step 3. Next, scroll down the screen and tap on AirDrop. Step 4. On you iPhone screen you can appear various sounds effect, play one by one and choose a favorite one. 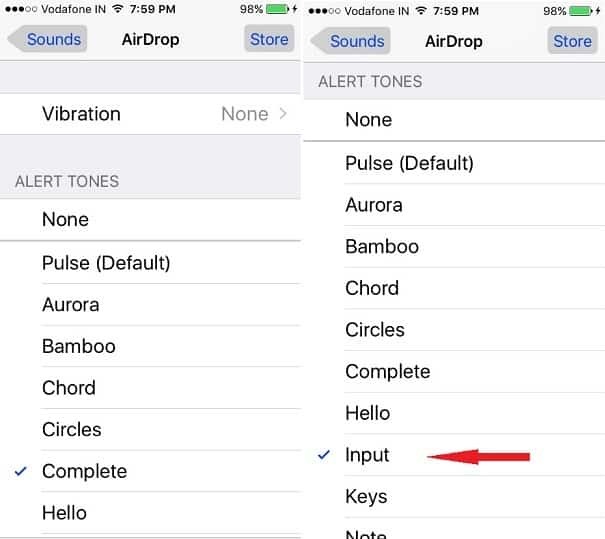 After changing Airdrop sound, you will hear a fresh tone while you received a file, photos, Music on third party apps via AirDrop If you don’t like Airdrop Sound. Then you can do mute. Open Airdrop sound settings and then under Alert Tons tap on None option. If you ever won’t hearing Airdrop or other Alerts on iPhone. First of all, you must check out under the Sound (Sound & Haptics) settings that the Alert tone not Marked on None. Above given same steps you can also be applied to change Alert tone for iPhone reminder alerts, Calendar alerts, Facebook Post, Tweet, Sent Mail, iPhone Text tone, New Mail, Sent Mail, New Voicemail, etc. Share your reply in the comments and write us if any issue or require further assistance about to change Airdrop Sound effect on iPhone. Do you find settings to change AirDrop sound on Mac? Please share it. Get here flagship troubleshooting to fix AirDrop not working on iPhone to Mac; AirDrop Grayed Out, Share Apple Music Airdrop, AirDrpo icon disappeared on iPhone control center. Stay tuned to get daily more from us on Apple Watch, Apple TV, macOS, and iOS. You also find us on on Google Plus, Like on Facebook, and follow on Twitter.